2012 has now come to a close. Looking back through a full year of posts reminded me of all the special celebrations I made treats for, all the sweets I’ve shared with family and friends, and all the fun little projects I’ve had the privilege of sharing with you over the past year. Thank you for an amazing year! This blog has become such a big part of my life. I often stay up very late working on posts, my kitchen almost always shows the signs (the mess) of my current “project”, and my grocery bill is full of more pounds of butter and cream cheese than I care to calculate! This is my passion, my hobby and my job. I take it very seriously, and it is very important to me. I guess it sounds funny to say I take making cupcakes and cookies “very seriously”… but I do. It’s part of who I am. Between planning posts, baking and decorating treats, taking photos, writing posts, replying to e-mails, and lots of other little things that keep this site running, I spend many hours a week on this “little” blog. It is a lot of work… but also very rewarding! After a long day that may include failed recipes, photos that took much longer than planned, more e-mail questions than I have time to answer, and a family (my sweet family) who somehow needs dinner every night… I will get an e-mail… an e-mail that keeps me going. An e-mail from a 12 year old who is learning to bake using my recipes, an e-mail from a mom who just used my ideas to pull off a beautiful party, an e-mail from someone who took cookies into work that were “a huge hit”, and sometimes an e-mail from someone just saying thanks for all the things I share. What I’m telling you is your words are very important to me… in fact, they are everything. If you have spent time on my site this year reading posts, thank you! If you “like” me on Facebook, follow me on Twitter, Pinterest, or Instagram, thank you! If you have left an occasional sweet comment, thank you! If you have sent me an encouraging e-mail, thank you! Your support and encouragement mean I can continue doing what I love… baking, party styling, crafting… and for that I am very, very grateful! I chose a few unscientific approach at choosing my “top 10” posts of the year… I looked at the posts that had been pinned to Pinterest the most, posts that received the most comments, and posts that were personal favorites of mine… and kind of merged them together to create this list. 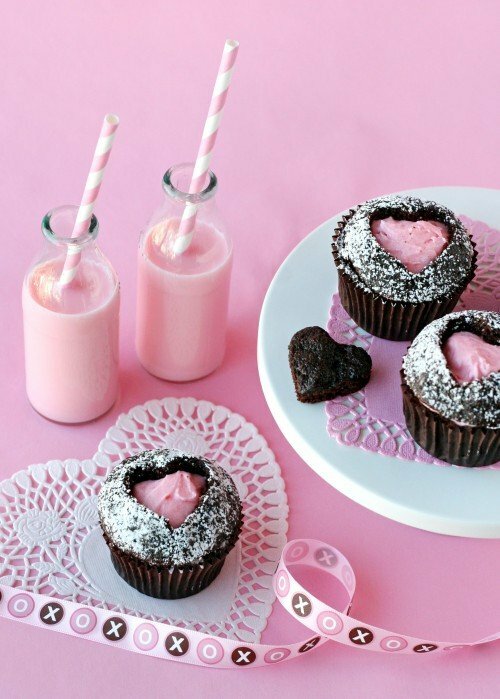 Early in the year I made these sweet, heart cupcakes. Like many projects, this concept (originally from Just Jenn Recipes) had been on my “to bake” list for quite some time. I was so glad to finally get to play with the idea. I liked it so much I made a St. Patrick’s Day version a couple months later. 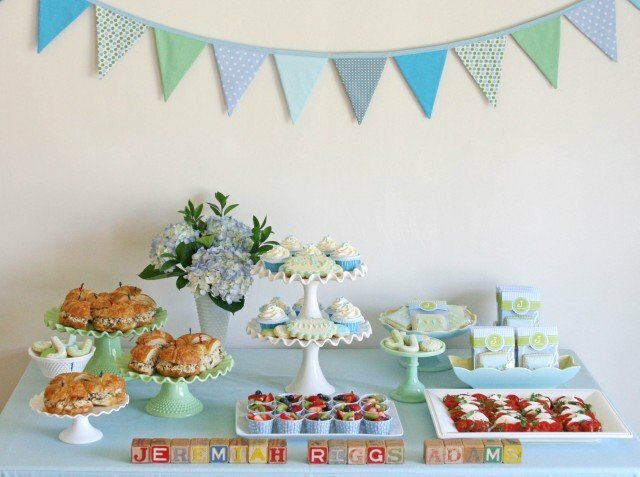 This baby shower was extra special to me! This was for my younger sister and her very first little baby, a sweet boy. I had a great time planning the details, and then sharing the day celebrating this beautiful occasion with our friends and family. In addition to all the party details (in the link above), I did a full post with the Fabric Bunting Sewing Tutorial. This one actually surprised me… this post (and this image) was my #1 most pinned post of the year! I guess when you layer homemade pastry cream, whipped cream, bananas and caramel… you really can’t go wrong! 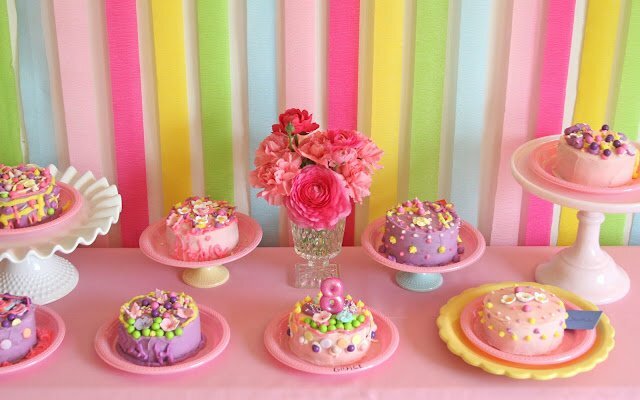 My oldest daughter, Grace, is a craft loving, art loving, mini baker and requested a cake decorating party for her 8th birthday. We had a great day, and all the little guests really enjoyed decorating their own mini cakes. These watermelon shaped krispie treats (directly inspired by Dine and Dish) were so fun to make! I made several batches these cute treats over the summer. Later in the year, I made some Candy Corn Krispie Treats, and then Christmas Tree Treats using the same concept. These cute, simple and delicious treats were based on my Cherries on a Cloud, and Candy Corn Cheesecake Mousse. The basic cheesecake filling is so easy to make, and is delicious with any variety of toppings! 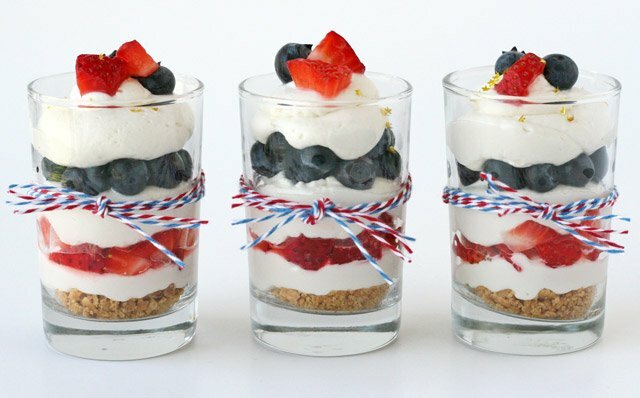 Continuing my love of desserts in jars, I snuck in a couple more this year! 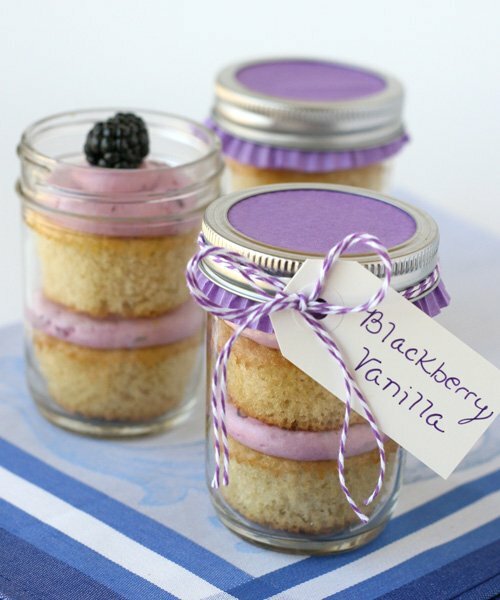 One of my favorite (and quite popular) elements of these cupcakes was the use of a cupcake liner as a jar topper. I’ve used this idea several more times, as it’s such a simple and pretty way to finish off a jar of treats. 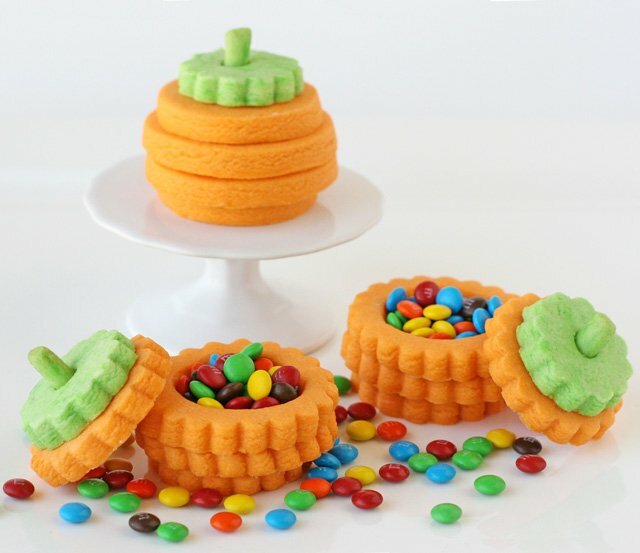 The idea for these 3-D cookies was born early in the year, and it was hard to wait until fall to share it! It was one of the fun times (and few times!) that an idea I had in my head actually came together the way I had imagined! Later in the year I made some 3-D Christmas Drum Cookies using the same concept. I made lots of decorated cookies this year! 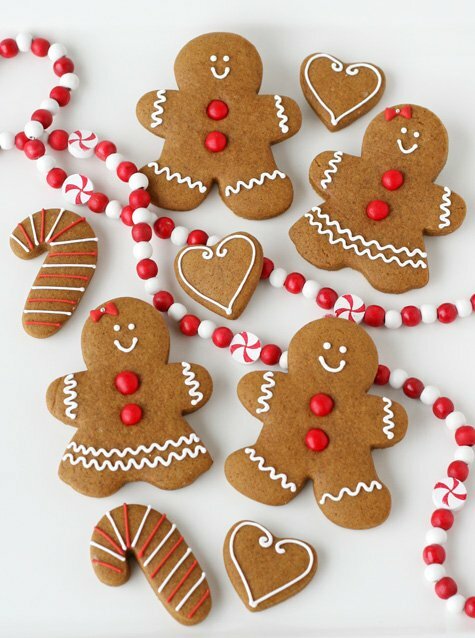 These sweet gingerbread people were certainly the simplest of the bunch… but they represent so much of what I love about baking. They are cute, delicious, and are very likely to make you smile… and for those reasons they are pretty much perfect to me. I made these for a Gingerbread House Decorating Party we hosted for my daughter’s and their friends. It was a beautiful way to kick off the Christmas season and it was a very special day of enjoying sweets, being creative, and spending time with friends. Did you see your favorites in this post? Did you make any recipes, or try any ideas from my site this year? Any special request for things you like to see more of in 2013? Thank you again sweet readers for making 2012 a wonderful year! Such a great roundup of a gorgeous selection of your amazing talent, showcased over the past year!! It has been so much fun watching and waiting to see what you come up with next, and I can only imagine that the year ahead will bring even more brilliance to the table as your passion and creativity grows with each new offering (though it’s hard to imagine how you will top this year *wink*)!!! I am looking forward to seeing your creations, and having a go myself at some of your recipes and ideas … Wishing you a safe, creative and passionate year ahead!! 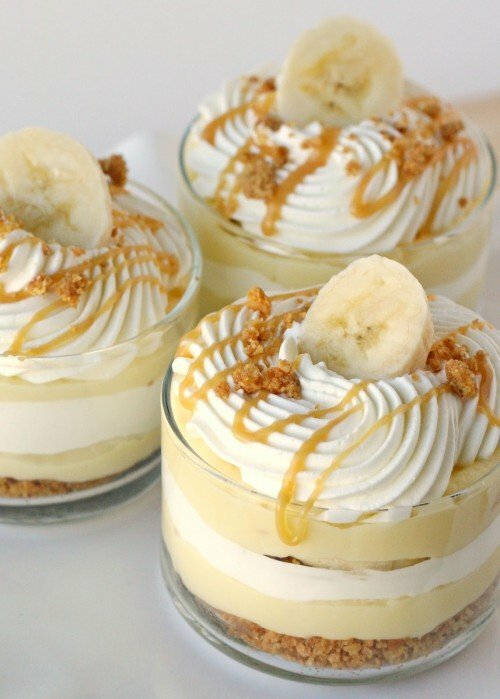 I want to try out your Banana Caramel Cream Dessert! Sounds divine! 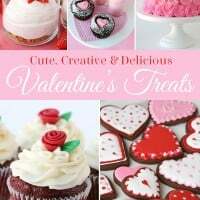 Looking forward to more cupcake ideas from you! I very much enjoyed reading your blog this year! And I made your gingerbread cookie recipe this Christmas. Oh my goodness! They were delicious! And you also inspired me to put cupcakes in jars. They came out so cute! Can’t wait to see what you come up with next year. You had such a great year. Here’s to another awesome one! I LOVE your site and your creations and look forward to many more sweet goodness in 2013 – happy new year! I’ve lost count of the many posts you’ve inspired me to try and everything I make is always a hit! Thank you so much for taking the time to do this blog and share so many wonderful ideas and inspirations. I can’t wait to see what you come up for this year. Keep up the great work and thanks for all you do! The Banana Cream dessert popped out to me IMMEDIATELY! When I go to a restaurant, if there’s even a small chance that I will have dessert, it has to have bananas or ice cream in it. Otherwise, I pass. Your presentation of this dessert has my mouth watering. Can I come over for dessert? Your site is so inspiring! While I am not nearly as talented as you, I love when you do a post on a party you threw. They are always so colorful, creative and fun looking, I wish I could go! Last year, we had a party for our kids that I based off of one of yours (rainbows and race cars). 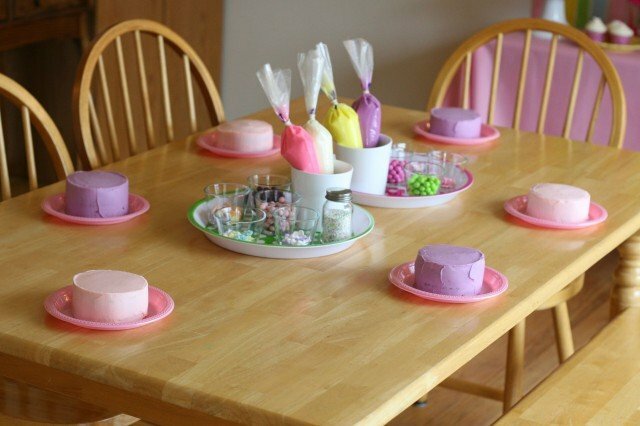 I would love to do the cake decorating or gingerbread house party- and with your guidance, I just might! Thank you so much, too, for showing us what your life is really like. It makes you so much more real and relatable. My kitchen is like yours! I don’t have a stand mixer or fancy gadgets. Your willingness to let us see your real life is so appreciated! 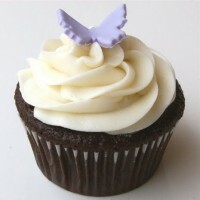 You are a very talented baker and blogger…i always enjoy visiting your blog and checking out your creations. My faborite was the pink ombre mini cakes. They are so pretty! Seriously??? you are so talented! I am obsessed with each of these desserts! I have enjoyed reading your posts and trying to make a few of the awesome treats I have seen, several that were on your best of 2012 list as a matter of fact……. looking forward to seeing of your new and really cool ideas in 2013! I’ve been admiring your blog for quite some time and this past month attempted my first decorated cookies. I had so much fun I made three batches – one for my work ladies, one for Christmas gifts, and one for Santa! Your cookies (and everything you make) are so beautiful and inspiring, thank you so much for sharing your work with us! I really enjoyed seeing your year in review photos…. 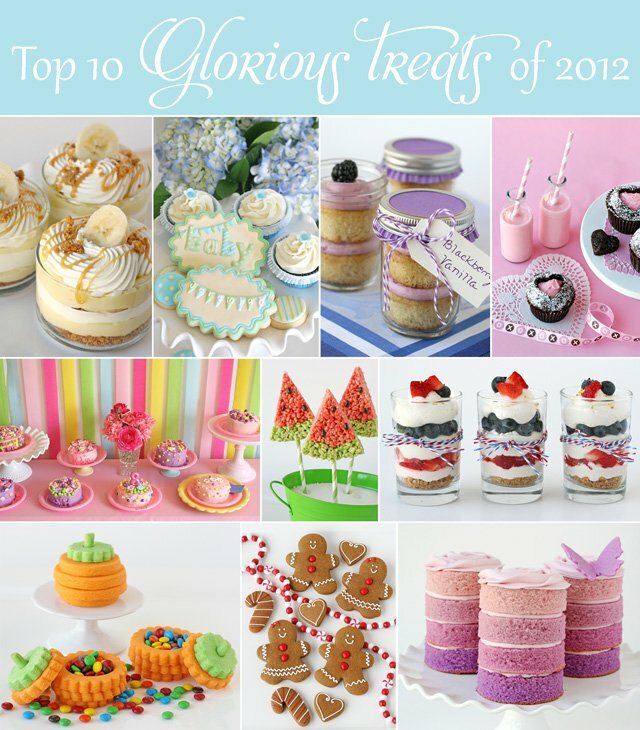 most of those were my all time favorites… i love every dessert and party set up and yummy recipe you make. i really appreciate pretty desserts and pretty displays and pretty packaging! you do it all great. thank you for sharing everything with us and I look forward to your posts in 2013. Happy New Year! Happy 2013. I love looking at your photos and I love all the changes since your blog became a dot com. Love you. My favorite is of course the baby shower. Thank you for giving me such a beautiful baby shower for Jeremiah. My favourites all!! !, but if you want me to be more specific…I would say the Watermelon , the purple mini cakes, and the heart cupcakes, beautiful. Looking at this roundup of your 2012 “Top 10” one thing is very clear (okay, 3 things! ): you are amazingly versatile and creative and do impeccably beautiful work each time! Thank you for the delicious inspiration! Just…thank you! Thank you for sharing the beauty you create. Your blog is the one I most look forward to checking every few days, and it always inspires me! Everything is just SO perfectly beautiful! Love it all, Glory!! So glad that 2012 involved me getting to hang out with you again!! You’re such a sweet friend and I’m so happy for your successes! Here’s to 2013 and keep the sweets coming!! Can’t wait to see you in June! Amazing as usual, you are indeed a rare talent! Just a message of thanks Glory. I found your blog when I was planning a September baby shower for our husband and wife choir directors. I used your almond joy bar receipe for part of the dessert table and everyone raved about them. It has now become the recipe I bring to parties and is requested by name. I enjoyed seeing your creative ideas in Women’s World – they have great craft and recipes, especially yours! Looking forward to another year of enjoying your blog. I especially loved the Aloha Cookies you made for your friend’s party. The details you provide make all the difference. Wishing you a wonderful and happy 2013! I am a new follower! I found you on Pinterest while looking for some healthier treats as I try to enact one of my New Years Resolutions (haha, just like the rest of the world, I suppose!). I found your wonderful jell-o rainbow parfaits and they are so pretty and tasty looking that I began to browse your site–what a talented artist you are. And, even more magical, you make it look effortless (and, we know better!). I look forward to a year with you and wish you many blessings in your work. Thanks for the inspiration! Hi Glory! I want to wish you a very happy 2013 and I love your new design for the blog, so beautiful! so much amazingness! 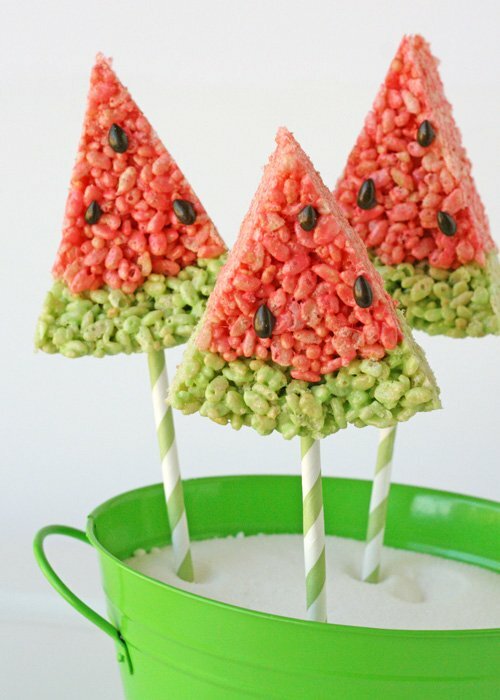 i love the look of those watermelon rice krispie treats, so sneaky and cute! those ombre mini cakes have to be my fave though. soooo pretty and mini! blog is looking great! happy new year glory! I have a passionate love for your vanilla cake. So incredibly good. I’m so obsessed with that recipe that I haven’t even tried the chocolate (usually my favorite). 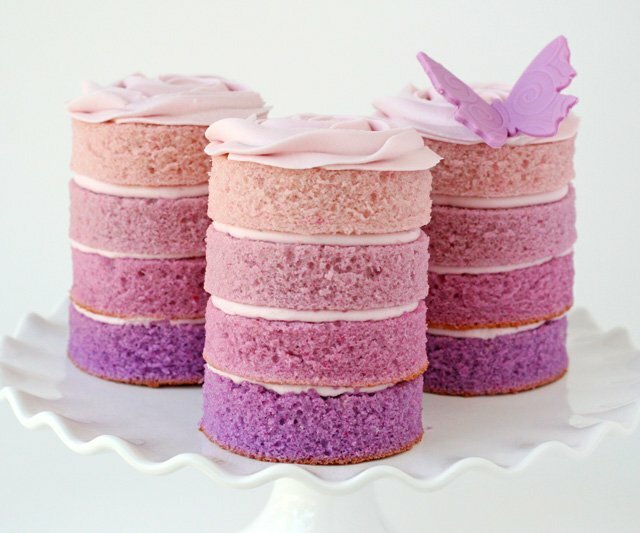 I haven’t tried making the ombre cake yet, but I really really want to! I’m going to make the brownies you recently posted tomorrow, and my next project will be the ombre mini cakes! Happy 2013 and thanks for all the beautiful inspiration! I just found your blog the other day. Am so Glad I did. I made your Vanilla Lemon cupcakes last night (first time making home made cupcakes and icing) as a test run for my daughters 3rd birthday. They were amazing and so easy to make. I sent them to work with my hubby. Everyone loved them and “hated” me for sending sweets for no reason. It is nice to see another Mom who goes a little overboard (in a good way) with parties and treats. In this list I found 2 more things to try out both for my son’s first birthday (in October see a little overboard as his birthday will take as long as or longer than he did to create). Anyway I just wanted to say THANK YOU and keep sharing the fun.